The image above is a link to an online eBook produced by Artists Info for me. The magazine is 18 page and shows some of my art work. Just click on the image and you will see the magazine load in the browser. I hope that you enjoy looking at the iamges. My nudes and portraits are heavily influenced by expressionistic painters and I block in strokes, to create volume and space. 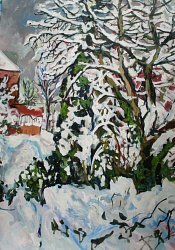 Painters such as Laura Knight, Lucien Freud, Ludwig Kirchner based their work on a similar scheme. My colours and tones are not naturalistic, I use complementary colours from the colour wheel, influenced by the emotions and dynamics of the scene. The Fauves, Matisse, Mathew Smith and Kees von Dongen are also major influences, as are the Scandinavian artists, Munch and Anders Zorn. I often simplify form and tone; looking at the basic structure and design of the figure and how it fits into 3-dimensional space. I also carve and model which I believe has influenced the solidity of my figures in drawings and painting, I often work with a grid to develop the composition and this is most evident in my sketch books. 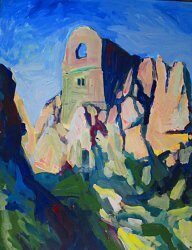 Considerable time is spent in preparatory studies and then the paintings are done directly from life, usually working on primed heavy watercolour paper using a strong tonal wash, cadmium red, vermillion, occasionally blue or green. I work over this in charcoal, then build the painting using blocks of colour and tone. Although I generally work in a very loose expressionist way, I find careful drawing and measuring is essential at an early stage for composition and proportion. The image above is a link to an online eBook produced for me by Artists Info. The magazine shows some of my art work. If you click on an image, you will see the magazine load in the browser. I sincerely hope you enjoy my images. I painted this in my studio in Springtime and the morning light gives a wonderfully light vibrant colour range. Painted in acrylic on 300 pound watercolour paper, A1 size 75 by 56cm. This was painted in the evening in the studio, allowing me to concentrate on colour and complementary shadow. Painted on watercolour paper 76 by 55cm. I wanted to capture the character of my sitter who is a high-wire performer. I have been influenced by the German expressionists Otto Dix and Max Beckman in this painting. Painted on watercolour paper using a red ground It measures 76 by 56cm. This was done in the evening utilising a heavy red drape background. The model is mainly in shadow with only a little overhead light. It is unusual to have a standing pose, but I took Euan Uglow as my inspiration. On watercolour paper with coloured ground painted with acrylic and mixed media. Measuring 76 by 56cm. Loretta is one of my favourite models, full of vitality and I hope this pose conveys the energy with the use of dynamic composition and strong colours. Painted in Acrylic on watercolour paper, 75 by 56cm. This painting of Holly is in strong afternoon sun with little shadow, which creates a unique effect and I took advantage of the light and complementary colours in the shadows. I looked towards Klimt and Anders Zorn for inspiration. Painted on watercolour paper with red ground mixed media and acrylic. Measuring 56 by 75cm. I love doing portraits with a painterly rather than photographic approach. Here I try to capture the fashionable Martha who works in media. I like to capture the essence of the person. Painted in acrylic on watercolour paper, 76 by 56cm. Hayley is a model I work with frequently, taking pleasure in her colourful clothes choices. 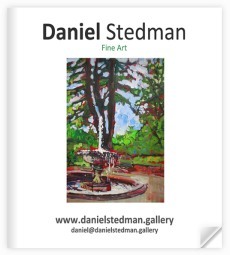 I am influenced in my portrait work by artists as diverse as Soutine, Klimt and more recently Stella Vine. Painted on watercolour paper 56 by 76cm in acrylic. I paint Emma regularly, her fantastic selection of colourful costumes allows me to create her as different characters, and employ a range of artistic influences. Painted in acrylic on watercolour paper 56 by 76cm. I am fascinated by the contrast of artist and model. Laura Knight’s famous image was a starting point but I have done many paintings on this theme. Painted on watercolour paper in acrylic 76cm by 56cm. Another painting of Rosheen in the studio with a mirror prop. As I was painting this the sun suddenly appeared to give this lovely tonal effect. Painted on watercolour paper 76cm by 56cm in acrylic. This pose of Sonia uses lighting to create a theatrical effect. Cool greens and blues of the drapes contrast with warm tones on the body and dark tones of shadow, emphasising space and volume. Edvard Munch was one of the inspirations behind this painting. Painted in acrylic on watercolour paper 76 by 56cm. My second favourite theme is landscape and foreign travel has taken me from the Poles to the Equator. 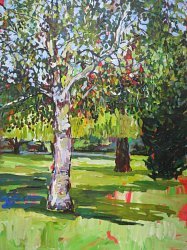 In Britain, I tend to paint parks and gardens, influenced by Post War British artists such as Nash, Spencer and Bomberg, as well as the earlier Romantics. I use modern acrylics as well as watercolour and gouache for sketches where it is possible to paint directly, as in mountains and volcanoes. My other great passions, geology and science are clearly reflected in my drawings and paintings of glaciers and volcanoes. Particularly important influences are the Scandinavian, Icelandic and Canadian Group of Seven. I have always relished their use of colour and abstraction as I do Mondrian's superb series of semi-abstract trees. I love the strong structural architecture of trees in winter and as a geologist am fascinated by the forces of nature - floods, earthquakes and volcanic eruptions. With meteorology and ever-changing cloudscapes there is a constant source of subject-matter. I have also worked on retreating glaciers as part of a project to record changes resulting from global warming in Iceland, Greenland Iceland and Patagonia. Painted on a hot sunny August afternoon at Cannon Hill Park, Birmingham. I wanted to convey the blend of heat with a light wind and dappled sunlight. Acrylic on watercolour paper. 61 x 85cm. Painted towards the end of May, with new leaves sparkling green against the Spring sky, like the impressionists I work directly from nature, on site, on heavy watercolour paper prepared with a red ground. Measuring 61 by 85cm. I painted this on a July morning while the light was still bright and clear. 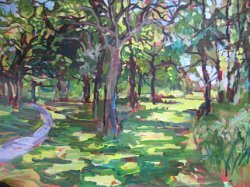 Elmdon Park is a landscaped area of mature woodland and glades, creating contrasting areas of deep shadow and dappled light Dimensions 61 by 85cm acrylic on watercolour paper. 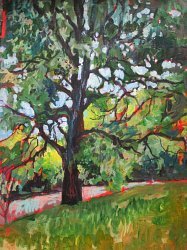 These lime trees were painted in June, with the sunlight giving a strong structural element and highlighting the branch patterns. I have been looking at Mondrian and his tree studies to develop my own work. Painted on watercolour paper Dimensions 61 by 85cm medium acrylic. Early Spring is a time of magically subtle colours, the cold of winter has departed and the garden shines in beautiful shades of green. This grand pear tree was just coming into blossom. Acrylic on watercolour paper 60 by 80cm. In an unusually warm early Spring, I spent a few days at Elmdon Beacon painting the bare trees in sunshine, their structure reminding me of Mondrian's studies. Painted on watercolour paper 80 by 65 cm medium acrylic. Since travelling in Norway and Russia, I have always loved birch trees and on a sunny afternoon in July, the small leaves create a shimmering effect. Painted in acrylic on watercolour paper 61 by 85cm. As a geologist, I am fascinated by our more unusual landscapes. This extraordinary chapel on a pinnacle of rock is near St.Austell, Cornwall and I loved the almost cubist feel. Painted in acrylic on watercolour paper 85 by 65cm. This Catalpa tree in the Botanical Garden made a fascinating subject with its huge leaves. This was painted on a thundery August afternoon which gave a distinctive hazy light. Painted in acrylic on watercolour paper 85 by 60cm. 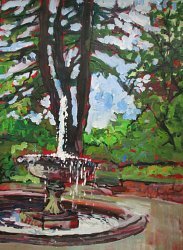 The fountain at the Botanic Gardens Birmingham is an iconic feature and set at a point where the paths converge beneath some cedar trees. This picture was painted in hazy afternoon sun. Painted on watercolour paper in acrylic 61 by 85cm. 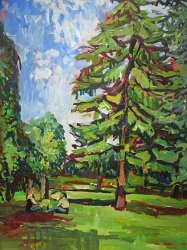 These large conifer trees bring a sculptural element to the painting. A heatwave, followed by thundery weather created a unique light with altocumulus clouds. Painted in the great tradition of modern English landscape work. Acrylic on watercolour paper 61 by 85cm.